To participate in any PvP activity, you must be at least level 30 and have met the requirements for a particular event to appear in the Duty Finder before you can participate (See each PvP area above for the requirements for each one). All PvP is accessed through the Duty Finder. There is no cost to participate; however, if you leave a PvP duty instance before it has concluded, you will be unable to participate in PvP duties again for 15 minutes upon exiting. Once you meet the requirements, it is a simple matter of queuing up in the duty finder for the event and tier you want to participate in. You can join alone, or with a party. 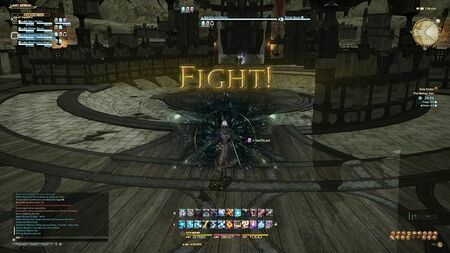 Players in the same party will be on the same side in the PvP duty. Things here apply generally to all PvP activities unless otherwise noted. See a specific PvP area’s page for rules specific to that particular area. All (or nearly all) abilities, spells and attacks function identically in PvP; However, special actions can also be acquired for PvP that can not be used in other areas. Exception: Raise can be cast in combat, while it is not normally possible in PvE areas. Another exception is enmity. Enmity is currently useless for PvP, so abilities that only generate enmity will have no effect. Damage is calculated normally, except that a special character attribute, Morale, reduces damage received from enemy players. This stat is not used in damage calculation against monsters. Crowd control effects (e.g. Sleep, Repose follow a 100% -> 50% -> 25% – 0% -> 100% -> … duration cycle. All chat is restricted in PvP, except for party chat and emotes. This is to minimize the potential for abuse. Note that you can still receive Linkshell and Free Company chat, but you will be unable to respond until the PvP instance has ended. Opposing players have their names masked until the battle is over. This is to reduce the likelihood of collaboration with the opponents. The Limit Break gauge is available; it caps at level 1 for Light Parties and level 2 for Full Parties; Level 3 limit breaks are not possible.